All of our groups that serve the poor and bereaved need your prayers. Please remember them when you pray and especially when you go to Adoration. Please pray for our sister parish, Our Lady of Nativity in Verettes, Haiti. Pray for our Catonsville 40 Days for Life which starts on March 6, 2019 and goes until April 14, 2019. Back to School Supply Drive - Every August we collect school supplies to be sent to different locations for children who cannot afford their school supplies. It is advertised in the bulletin. Go here for more details. Donate to SALT for food taken to the less fortunate - Details are here and signup is here. Donate food for SALT to take downtown on a Friday - signup is here. Advent Giving Tree - Every year we put trees in the back of the church with tags that you can take that specify a gift for someone. You take the tag and then return the wrapped gift in the following weeks. The details will be in the bulletin in late November or early December. Camp St. Vincent Summer Camp Supply Drive - Every June we collect supplies for homeless children to go to Summer camp. It is advertised in the bulletin. Go here for more details. Families Helping Families at Thanksgiving - Every November we bring in boxes that you can fill with food. The required food is in link, but you can feel free to add other foods as well. Please fill the box with the items listed in the link and please make a check out to OLPH-SVDP for $25 to cover the cost of the turkey and rolls. Put "Thanksgiving" in the memo line, put it in an envelope and tape it to the outside of the box.They are returned 2 weeks before Thanksgiving so that they can be distributed. Go here for more details. Put food in pantry at back of church - We have a food pantry that is used for anyone who needs help with food. It is used by people in need who call the Parish office. We serve those outside our Parish, but of course our own Parishioners can also contact the office if they are having a difficult time affording food. Go here for more details. Send a check to Our Lady of Perpetual Help and in the memo of the check write Haiti. To make “one time” donations via credit card click here. If you want to do a recurring credit card donation you will log into myOLPH here, select "Repeating Gift" and "Haiti donations Inc". Go to Missio to give a one time gift electronically. Fifth Fridays - On months that have 5 Fridays, we provide the meals at St. Vincents in Baltimore on the fifth Friday. Go here to sign up to donate something. Toiletries - We collect toiletries (shampoo, soap, lotion etc) to be distributed to the homeless. Please mark the bag with SALT and put it in the church pantry on the floor whenever you have items to give. We particularly like travel sized products but can use any size you are willing to donate. Our Daily Bread Casseroles - OLPH is committed to providing food for Our Daily Bread soup kitchen on the first Monday of each month. Parish members bake casseroles and desserts, drop them off in the Parish kitchen freezer, and deliver them downtown on the Sunday prior to the first Monday of the month. Click on the link for the casserole recipe. Go here for more details. Cook food to go to the homeless - Details are here and signups are here, and here. Cook for the less fortunate in the OLPH Kitchen - Details are here and signup is here. Hand out Baby Bottles for the Respect Life Fund Drive. Advent Giving Tree Collection and Transportation - Every year we put trees in the back of the church with tags that you can take that specify a gift for someone. You take the tag and then return the wrapped gift in the following weeks. We need to collect the gifts, store them and deliver them to the appropriate group. Go here for more details. Families Helping Families at Thanksgiving Collection and Transportation - Every November we bring in boxes that are filled with food. They are returned 2 weeks before Thanksgiving so they need to be collected and distributed. Go here for more details. Fifth Fridays- On months that have 5 Fridays, we provide the meals at St. Vincents in Baltimore on the fifth Friday. You can help prepare food in the OLPH kitchen. Go here to sign up and look for "Help prepare food at OLPH". Stephen Ministry - Our Parish's Stephen Ministry equips lay people to provide one-to-one Christian care to people in our parish and community who are experiencing difficulties in their lives. Please see our Stephen Ministry page here to get the details. St. Martin's Home in Catonsville - Details are here and signup is here. Go into Baltimore to serve food - Details are here and signup is here. Fifth Fridays - On months that have 5 Fridays, we provide the meals at St. Vincents in Baltimore on the last Friday. 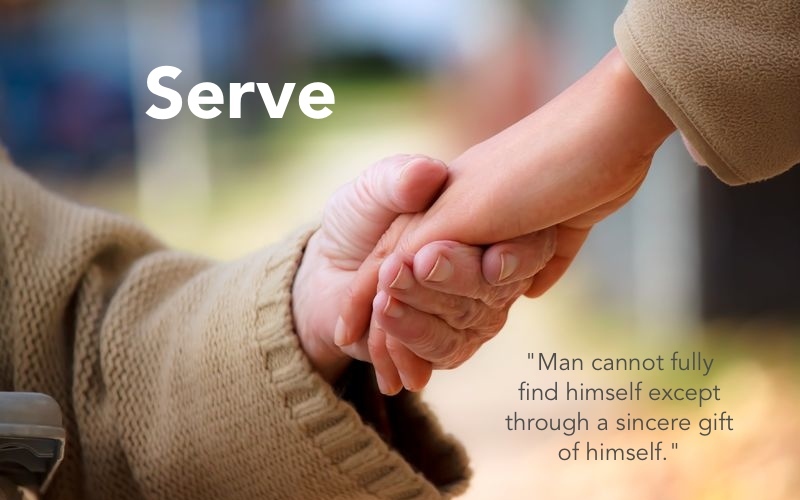 You can help serve or transport food. Go here to sign up and look for the entries that have "Serve" and "Transport". Go to the Hillcrest Abortion Clinic in west Baltimore to pray during Catonsville 40 Days for Life which starts on March 6, 2018 and goes until April 14, 2018. Pray with your children about those less fortunate. Make a casserole or dessert for the first Sunday of the month at your home - see Our Daily Bread Casseroles for details. Put together bag lunches/snack bags to be passed out on weekends - email SaltAtOlph@gmail.com for information. Visit St. Martins Home in Catonsville to befriend an elderly person. Early November - sort the Thanksgiving boxes at the Parish. Late November/Early December - help sort the gifts for the giving tree at the Parish. Late November/Early December - Write cards at Christmas and Thanksgiving for packages. Help with Diapers and Wipes with the Respect Life committee. Do a Spiritual Adoption of a baby - click here for details. Haiti Committee - email Maura Maguire at maura.maguire@yahoo.com or Bill Babcock at billb126@juno.com. Stephen Minister - Become a Stephen Minister and help those from our Parish in difficult situations. Click here for more information.